In June LGBTQ communities across the globe celebrate Gay Pride with parades in part to commemorate the 1969 Stonewall Inn riots when for six days gay New Yorkers fought back against the routine bar raids, harassments, and arrests by the NYPD. Those six nights in June inspired the gay civil rights movement—then and now. But just four years later, on another June evening, an almost forgotten event occurred in a gay bar in New Orleans, the horrific fire at The Up Stairs Lounge in New Orleans. The fire that took the lives of 31 men (several of them military veterans) and one woman and injured dozens among approximately 100 gay patrons . 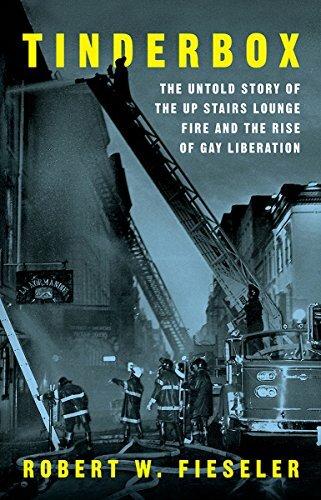 Now 45 years later, Robert W. Fieseler’s Tinderbox: The Untold Story of the Up Stairs Lounge Fire and the Rise of Gay Liberation investigates the crime and unmasks the level of official homophobia against the city’s large gay community. But mostly it honors the memory of the victims. Fieseler’s fully sourced research correcting the record of shoddy crime work by both the New Orleans police and federal investigators. Despite the loss of life and many other survivors suffering serious injury, the fact this was a fire in a louche gay bar in the old French Quarter and how it changed the lives of the survivors and the New Orleans GLBTQ community, was left out of media reporting. The words homosexual and gay were left of most of the reporting by the straight press and if it did appear it was in a dismissive or derogatory way. As far as the city of New Orleans was concerned, the tragedy didn’t even happen. In the wake of other events that involved loss of life in his city, New Orleans Mayor Moon Landrieu offered official condolences and support to victims and survivors, but he was loudly silent in the aftermath of the gay bar fire. The police may have gone through the motions of investigating the fire, but from the start, they treated it like a crime not worth their time. Evidence and witnesses were mishandled, and they didn’t aggressively pursue leads to find the perpetrator. The police even questioned the arsonist, after witnesses put the arsonist at the scene and provided possible motives but did not arrest him. It was through a confession to his friends that Roger Nunez admitted his guilt. He was a troubled youth who set the bar on fire after being kicked out for disorderly conduct. Before he committed suicide a year later, he confessed his crimes to a former nun and a man he was involved with. The Up Stairs Lounge was more than a dive bar with all of the French Quarter mystique of a Tennessee Williams play, it was a gay community center, host to fundraisers and amateur theater and a regular meeting place for the New Orleans chapter of Troy Perry's gay ministry The Metropolitan Community Church. Certainly the personal lives of the victims and the survivors were never part of the story in the media coverage of the time. Aside from telling the story of the dozens of victims and survivors, Tinderbox reveals the indignities the dead and survivors continued to suffer in the aftermath of the fire. Funeral homes refused to bury bodies, some families refused to identify bodies or contact relatives who were victims, police officers didn’t even want to talk to gay witnesses. Buddy Rasmussen, the manager of the Up Stairs Lounge, single handedly rescued 20 people by guiding them to a hidden escape route as the fire engulfed the bar. He even went back in, to try to save more, but it was too late. And after giving his account to police, he dealt with the fact that his lover Adam, had been trapped in the fireball that had incinerated moments earlier. His heroism, in particular, was ignored by the media. Fieseler condenses a lot of history of The Big Easy, which wasn’t so easy for everybody and its conflicted image as a gay mecca, but otherwise was a completely oppressed community. Tinderbox paints a vivid picture of the (in)visible gay community of about 400,000 strong, but where a gay person could still be arrested for even the suspicion of being gay or their names were printed in the paper if a bar was raided, people could be fired from their jobs, and routinely barred from many professions. Fieseler does invaluable investigative reporting of the social landscape of the era and writes with sensitivity about the many victims of the fire, their lovers, their families, their survival and the profound effect it had on GLBTQ community in NOLA. Many of the survivors were initially declined to be interviewed for the book, but Fieseler writes in his introduction that they changed their minds in the aftermath of the massacre in June 2016 at the Pulse Nightclub in Orlando two years ago, which brought new attention to what was among the most horrific tragedies in gay American history. For generations gay communities were treated separate and unequal in the eyes of the law. Tinderbox is a reminder that this history can never be forgotten as the backlash against GLBTQ civil rights are once again under attack. Lew J. Whittington writes about the arts and gay culture for several publications including Philadelphia Dance Journal, Dance International, CultureVulture, and Huffington Post. His book reviews and author interviews have appeared in The Advocate, EdgeMedia, and the Philadelphia Inquirer.